Choose a Utah Real Estate ePRO Certified Realtor. The Internet has added a new dimension to the real estate world. Now you can be assured that the Realtor you choose will have the knowledge and skills to put the power of the Internet behind your real estate transaction. All Realtor e-PRO Internet Professionals are Realtor who completed a rigorous certification program endorsed by the prestigious NATIONAL ASSOCIATION OF REALTORS (NAR). Real estate agents and brokers who have earned the Realtor e-PRO Certification are Internet Professionals who have completed extensive training using the Web. Realtor e-PRO Certification means the real estate professional is prepared to employ the latest techniques and services for your benefit, just like you've grown to expect from a professional. Work with a Realtor e-PRO Certified real estate professional who provides both buyers and sellers with high quality, timely information using the resources of the Internet. Realtor e-PRO Internet Professionals maximize your ability to leverage the enormous power of the Internet when you are buying and selling property. 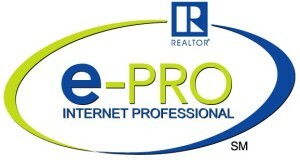 The Principal Broker Paul Teasdale and Associate Broker David Teasdale are both e-PRO Internet Certified Realtors. Paul and David both own and operate websites that help promote their homes for sale in Utah County. If you are looking for a high-tech Realtor to represent you in selling or buying a home in Utah County contact Paul or David Teasdale. Paul and Dave both have the Utah Real Estate e-PRO designation. An e-PRO's access to advanced technology can save you considerable expense. You have more tools to find or market your home, so you're likely to get a better price. With on-line home tours, you reduce in-person showings——and the costs involved. And by using e-mail, you save money on long-distance calls and fax charges. Relocating? An e-PRO is ideal for you. With the tools to do your research electronically, you can make a decision on a home the first day you're in town——or without traveling at all. You and your family save on travel costs. And after you've decided to buy, monitoring the sale by e-mail saves you even more. Should you use an e-PRO? Yes——especially if you're an Internet user. In this fast-paced age, technology has become a necessity. An e-PRO is someone who has recognized and responded to the needs of the new consumer. If you choose an e-PRO, it's a safe bet you'll get the kind of service you want——and need. Paul and Dave have earned their Utah Real Estate ePRO Designation.